Bob Carlton began flying in 1979 at the age of 19. He has since logged over 2000 hours in a wide variety of aircraft and holds a commercial pilot certificate. 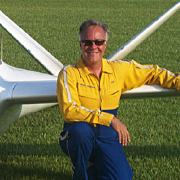 Bob has flown hang gliders, airplanes, helicopters, and sailplanes from hundreds of sites in the US, Canada, Mexico and Australia. Bob has flown airshows professionally since 1993. He lives in Albuquerque, New Mexico with his wife Laurie and their dog, Ginger. He is a member of SSA and ICAS. Bob is one of the most versatile airshow performers in North America. He began flying airshows in his Salto sailplane, and over the years has continued to add innovative performances such as barnstormin’ biplane aerobatics, helicopter sailplane tow, night aerobatics with strobes & pyro and the world’s only twin jet sailplane. The tradition of innovation continues with the recent addition of the Super Salto jet sailplane, with more power, more speed and more aerobatic capability than any other sailplane on the planet! Bob Carltonis a retired rocket scientist for a major national laboratory.